A century is defined as one hundred consecutive years. Most of us will not live to experience that period of time so to have something that has been in the family at least a century is noteworthy. Especially if it is the family farm. Land was very important to our ancestors. Many of our ancestors came to this country just so they could own property. Once they became property owners they worked hard and sacrificed much to keep and maintain their land. In our family, two farms, one on my paternal side and one on my maternal side, have been in the family over one hundred years. And I think that is pretty special. The Miller Farm was established 139 years ago by my paternal great-grandfather Jacob Miller. Schumm Evergreen Farm, was established 134 years ago by my maternal great-grandfather Louis J. Schumm. Both farms have stayed in the family all during that time. 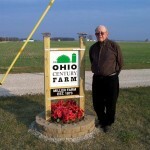 When I heard about the The Century Farms of Ohio Recognition Program I knew I wanted to register our family farms. I enjoy joining lineage societies so of course I wanted to apply to this program. In 2008 I applied and received the recognition for both my parents as birthday surprises. I gave them the certificates and Century Farm signs as their gifts. 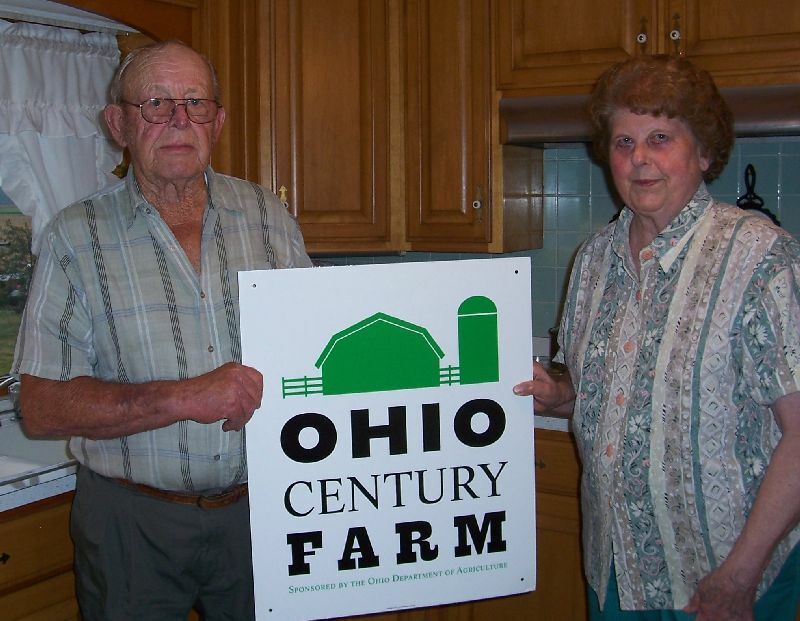 Ithink it is rare that a married couple has farms on both sides that are designated as Ohio’s Century Farms. Ohio Century Farms recognition, 2008 birthday surprises. The Century Farms Program recognizes families who have maintained a farm in their family for at least 100 consecutive years. Families who wish to have their farm recognized must submit a Century Farm Registration Form. Qualifying farms receive a certificate signed by the Governor of Ohio. Recognized farms may display the Century Farm yard sign. Signs may be purchased by contacting the Century Farm Coordinator at the Ohio Department of Agriculture. 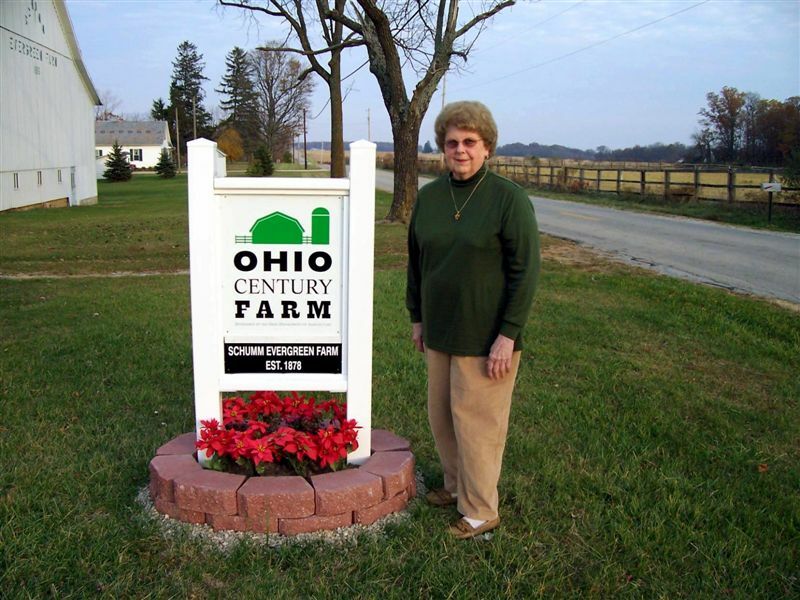 The Century Farms website also includes a list of Ohio’s Century Farms, a downloadable pdf version of the Century Farm Registration Form, newsletters and The Century Farms Special Recognition List. 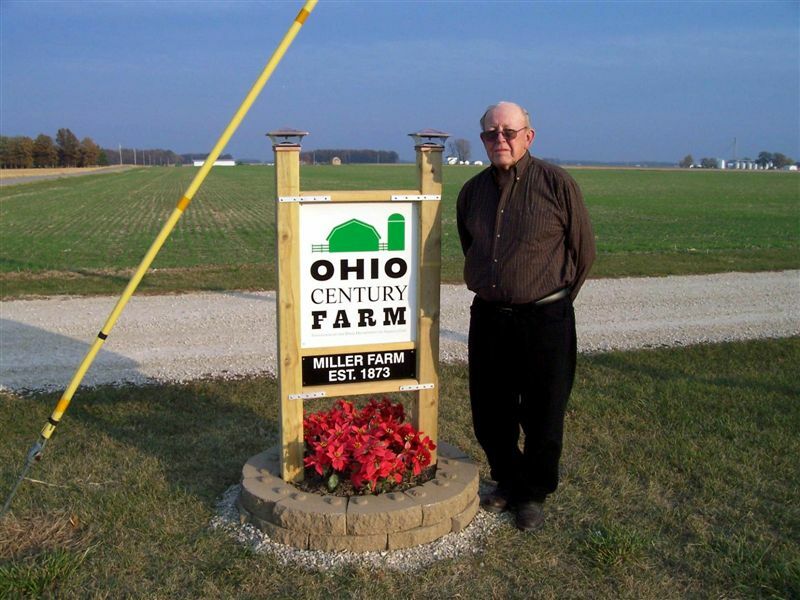 As of 5 October 2012, Ohio’s Century Farms Program has 930 farms registered, with a farm registered in all of Ohio’s 88 counties. Twenty-three Century Farms have been recognized in Mercer County and ten in Van Wert County. Ohio’s oldest registered Century Farm is the 240 year old Smiley farm in Adams County, established in 1772. This land was deeded to Alexander Smiley from King Georg III and was part of Virginia at that time. Ohio’s Century Farms application was not too difficult to complete compared to some of the lineage applications I have filled out. It was four pages long and they asked for copies of deeds to show the chain of title. Deed research gave me an excuse to research at my favorite office at the courthouse, the Recorder’s Office. I also included some old family photos and farm photos with my application. 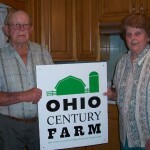 There is no charge for applying to the program but you have to purchase the Ohio Century Farms signs if you want them. 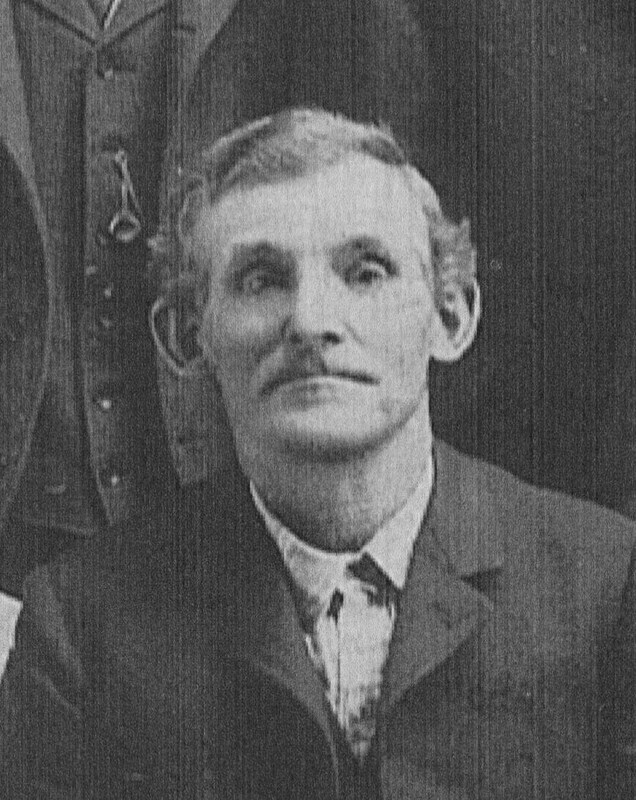 Jacob Müller/Miller emigrated from Germany in 1871 and purchased 80 acres of land in Blackcreek Township, Mercer County, from Jesse Hartzog in 1873. 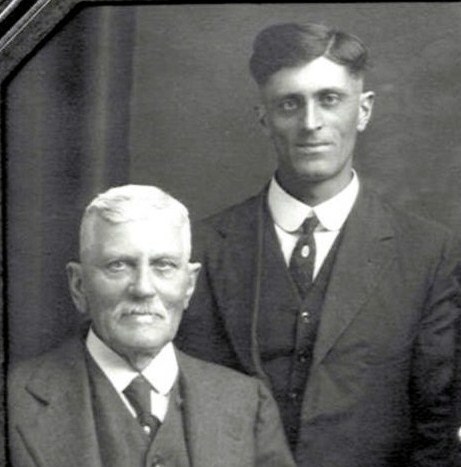 Jacob’s son Carl Miller (my grandfather) purchased the land in 1919 and Carl’s son Herbert Miller (my dad) purchased the farm in 1974. The farm house was built in 1895 and barn was built in 1909. Both Carl and Herbert were born in the frame house. Jacob had a small herd of dairy cows and raised hogs and chickens. At one time there were seven working oil wells on the farm. My dad farmed the 80 acres until he retired from farming in 2003. 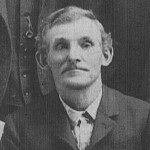 Louis Schumm, son of immigrant Louis Schumm, purchased 80 acres of farm land from Henry Tindall in 1878 and 20 acres of woods from Henry Schumm in 1879. Both parcels are located in Willshire Township, Van Wert County. 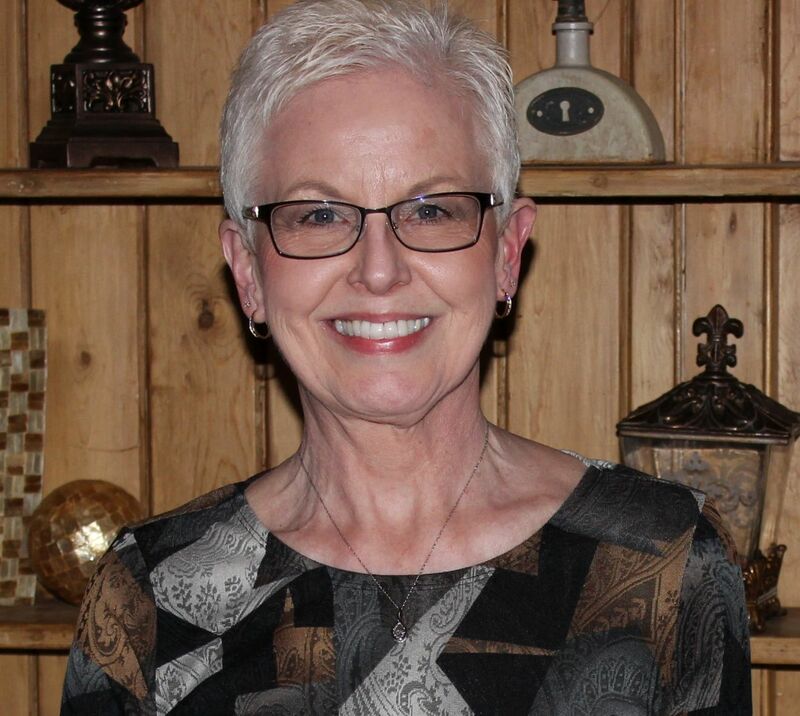 Louis’ son Cornelius Schumm (my grandfather) purchased the farm in 1938 and Cornelius’ daughter Florence Miller (my mother) purchased the farm in 1986. The farm house was built before 1872 and the barn was built in 1886. Cornelius and Florence were both born in the farmhouse. The Schumm farm is known as Evergreen Farm, named from the time when Louis and Cornelius maintained an elaborately trimmed evergreen hedge around the yard. Cornelius owned and operated a sawmill at the edge of the woods for many years. 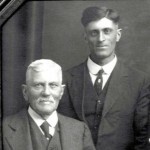 Louis (1851-1938) & Cornelius (1896-1986) Schumm. Wheat, soy beans and a little corn are grown on the farms today. Make sure you take notice of the Ohio’s Century Farms signs as you travel through Ohio. Those farms contain a lot of history. 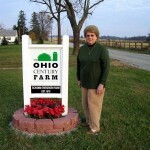 Karen, when driving past your Dad’s home place this past weekend, the sign (Century Farm) appeared to be missing. Perhaps I was mistaken as I glimpsed rather quickly and saw only a single post standing there where I thought the sign had been. Is the farm still in the family? Hi Waldo! Yes, the Miller farm is still in the family but my dad sold the house, barn and other buildings before he passed away. So, the Century Farm sign ended up being on the new owner’s property. We pulled up the sign but just haven’t had time to put it back up in a new location on the farm. We’ll probably do that next spring. I think your farm could be a Century Farm, too! You should do that. Indeed, the back half of the farm was first purchased by Andrew in 1864. Michael bought the front half some years later, but I would have to look up the actual year. While the formal acknowledgement would be nice, perhaps, the fact that the farm is still in the family is sufficient for us at this point. Each generation has had to struggle to maintain the property in the family and many times that effort got a little desparate as economies changed and debts grew, so we owe more than we can really understand to those who put so much into the land. Your description of your great grandfather’s farm could easily fit nearly every farm in the area back then, a few cows, several hogs and some chickens, occasionally a sheep or goat, not to mention the work horses. Now there are nearly no farms with diverse livestock other than the local Amish. Virtually none who butcher, garden and self sustain the way those old timers did. Karen, this was such an interesting read! I came across it doing family research for Henry Tindall. I am a direct descendent. Is it my understanding that the farmhouse is still standing? I am guessing that my family must have also lived in the home, if it still exists — just curious! Yes! The house is still standing and looks much the same as it did over 100 years ago. Have you read my post, The House On Evergreen Farm? You might find it interesting and there are some photos of the house, too. How interesting that your ancestor Henry probably lived in the house before it was moved closer to the road. I wonder if Henry built the house? Thanks for writing, Sarah.